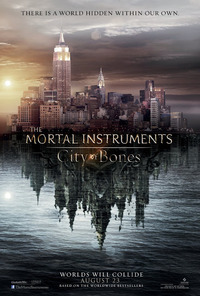 The Mortal Instruments: City of Bones is the latest YA adaptation to grace our screens, but demonstrates little of what makes the supernatural teen film a compelling genre. Clary (Lily Collins) is an ordinary teenager. She’s good at drawing and hangs with an arty crowd, but seems equally happy out clubbing in what appears to be an under 21s version of The Matrix Revolution’s “Club Hell. After witnessing a murder that no one else can see, Clary starts seeing strange symbols everywhere - and the murderer too. Clary soon finds out she isn’t so ordinary after all, but one of a long line of part-angelic demon hunters; and the unwitting subject of a plot with dire repercussions for the supernatural and mundane world. On paper, and due to my fondness for the genre, I should have loved City of Bones. I did, for the first fifteen minutes or so. The film sets up an interesting dynamic between Clary and her mother (Lena Heady). The costume design is a lot fun (sort of emo Assassin’s Creed via The Matrix for the Shadowhunters) and the creature design effectively disturbing for a 12A. The way the film teases Clary’s connection to the supernatural world is also initially very pleasing. As Clary’s friend Simon (Robert Sheehan) remarks, she goes a bit Close Encounters of the Third Kind. I’m not sure precisely when the film loses its way, but I slowly became aware that the film had stopped being fun and interesting and was instead boring and muddled. It’s just over two hours long, but felt longer. This may have had something to do with the ever-greater emphasis given to the love thread. Some readers may cynically remark, “well, that’s what the audience wants” to which I reply, “yes, but they want it to be good”. The relationship in City of Bones seems to exist with exactly that cynicism. It’s just there. It lacks the hyperbole of Twilight, or the sparky but earnest quality of Beautiful Creatures (the most fulfilling relationship in a film of this type). Even The Host does romance better. The romance is also - for want of better word - a bit weird. I can’t explain why without spoilers, but suffice it to say that there’s a narrative obstacle that makes the inclusion of the romance scenes seem even more cynical and less fulfilling in retrospect. The film doesn’t seem particularly concerned with depicting Clary as a unique character, just having her fluctuate between Bella or Katniss as suits the plot. I’m not saying a character can’t be both these things, but there has to be a sense to it. Clary is extremely tough and resourceful in an early scene, and doesn’t get to show that side of her character again until the dénouement. Collins’s performance is effective, but the character is extremely limited. The film stands as a cynical collage of the characteristic components of the genre, assembled without any care or understanding of how they might combine to signify something deeper. This review was published on August 26, 2013.